Covers basic operating skills and principles for safe off-highway riding. Covers basic operating skills and principles for negotiating the varying terrain that the sport of off-highway riding involves. Motorcycles and helmets are provided for your use. Many street riders begin as dirt riders since the physical operating skills are similar, but the dirt environment is more forgiving than the street. This course is conducted entirely outdoors in an off-highway area. It is not a license waiver course. A next-level off-highway course conducted on trails with various types of terrain. 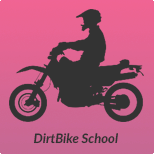 An extension of the DirtBike School, and for riders who already possess basic riding skills and are ready to ride off-highway trails. 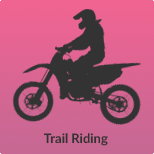 Lessons are conducted on trails with various types of terrain, and may include riding in sand and mud, through creek crossings and ruts, and over rocks, hills, and whoop-de-doos. A certified Coach supervises all riding activities, and motorcycles and helmets are provided for your use.